Any steak becomes even more luxurious topped with a dollop of this gently tangy Chive and Blue Cheese Butter. The herb butter also goes well with lamb chops and chicken. I love to spread it on crackers served with preserved figs, or the serve it with freshly baked bread. Blend all the ingredients in a mixing bowl, cover and store in refrigerator to allow the flavours to develop. Soften at room temperature before serving. At the top of the list is parsley as it’s such an excellent garnish for all your soups. And don’t forget flat-leaf parsley (Italian parsley) which will not only serve as a garnish but it will also add loads of flavour and nutrition, especially when used with Lovage in soup stocks. Chives is a close second because it’s also an excellent garnish and because it adds a delicate oniony aroma to almost any soup. Always add just before serving. Lovage gives more depth and flavour to the stock of all soups. It is especially good when combined with flat-leaf parsley. Use the stems as well as the leaves for better flavour. Winter Savory and thyme are good soup all rounders which can be used in a wide variety of soups. And they both make nice additions to bouquets garnis. Combine them with parsley, chives and lovage to liven up your existing soup recipes. These are all close contenders for the top 5 position because they are so versatile and because they all work so well with each other. If you are serious about creating gourmet soups you’ll find them indispensable in your arsenal. Here’s a list of the 36 herbs and spices we recommend in this Gourmet Soup Guide. You will note that we use the classification system we developed for making your own bouquets garnis. If you need more information on this system and how it will improve your cooking read this article. Bay leaf, chervil, chives, marjoram, parsley. Anise, basil, borage, dill, fennel, celery, coriander, salad burnet. Garlic, ginger, hyssop, lemon balm, lovage, mint, oregano, savory, sorrel, tarragon, thyme. Allspice, cardamom, cayenne, cloves, coriander seeds, cumin, juniper, mace, nutmeg, paprika, rosemary, sage, turmeric. This mild but addictive zesty tomato salsa is low in kilojoules and loaded with healthy phyto-nutrients and lycopene. Various studies revealed that men that eat lots of tomatoes had a greatly reduced risk of prostate cancer due to the lycopene in tomatoes. This tomato salsa is a delicious match with any braai meal, it also adds a bright note to any Mexican dish. I prefer to use ripe (red) Jalapeno peppers but you can use any chili pepper you like. And if you don’t have fresh peppers, dried peppers will do just as well. 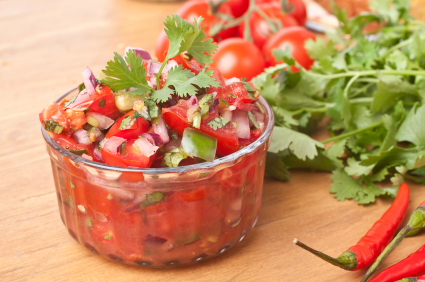 A zesty tomato salsa boasting loads of cancer fighting properties. Mix all the ingredients in a small serving bowl. Refrigerate for 30 to 60 minutes to allow the flavours to develop. Garnish with fresh cilantro just before serving. Soup is the ultimate comfort food. Nothing else can send so much rich aroma into the air, and nothing else so effectively makes every house into a home. Serve vichyssoise as cold as possible in chilled serving bowls. 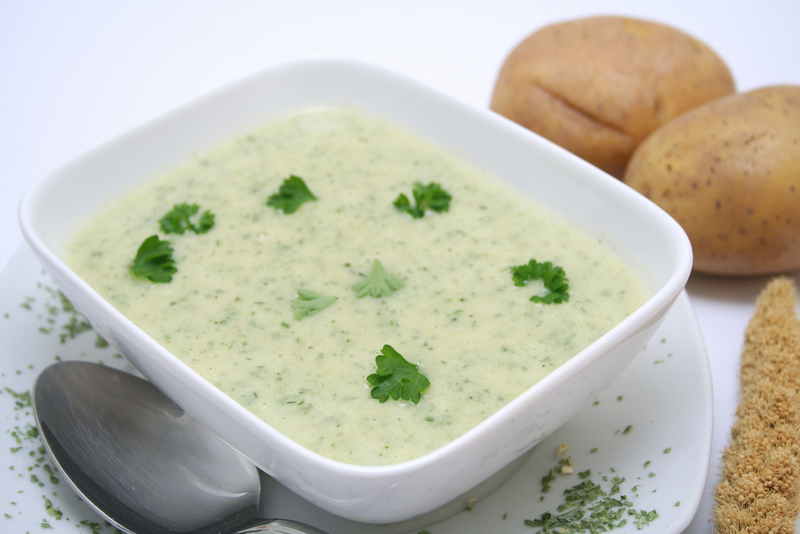 With that in mind here’s the recipe for our herbed version of Vichyssoise – a cold creamy leek and potato soup. It’s a great summer soup and it never fails to impress our guests. Cold dulls our sense of taste, so vichyssoise, require more seasoning than a warm potato-leek soup. Taste the vichyssoise again just before serving and adjust the seasoning as needed. Also remember that cold soups should have a thinner consistency than hot soups. To achieve this in Vichyssoise we use a higher ratio of liquid to main ingredients. On our list of favourite flavour combinations the combination of corn + chives + cilantro + sweet peppers features prominently. This recipe is especially good when made with freshly harvested sweet corn and vine ripened sweet peppers from the food garden. 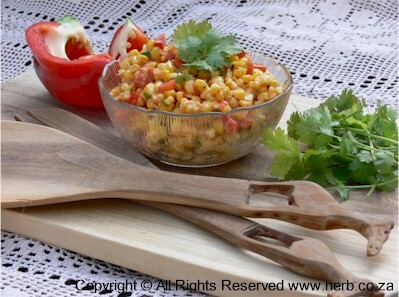 This easy corn salad recipe is a must when you are having a “braai”. It is simple to make and goes well with any type of meat. I prefer it with chicken or lamb. Rub each corn cob with butter. Roast the corn on an open fire or grill for approximately 10-15 minutes turning regularly. Meanwhile take a mixing bowl and combine the mayonnaise and yogurt together. Add the chopped chives, cilantro, and cayenne. Use a knife and remove the corn from the cob. Add the corn to the mayonnaise mixture, and mix. Add the chopped red pepper, lemon juice, salt, pepper, and mix. Variations: Use red chilies instead of red peppers. Tip: Your grill or fire can be hot, just make sure you turn the corn regularly so that it doesn’t burn, but still obtains some grill marks, which adds great flavour. Ripe avocados are an almost complete food. Giving us lots of natural potassium, beta-carotene, vitamin E, some vitamin B and C, a little protein and starch and avocado oil, which is mainly a monounsaturated fat. Avocado, chives and marjoram, is a match made in heaven and its healthy indulgence at its best. Halve the avocado and remove the stone. Scoop out the flesh, without damaging the skin, and mash it with the lemon juice. Blend in the cream, chives and marjoram and season with salt and pepper to taste. Pile back into avocado skins (or scoop into a small serving bowl) and add a few sprigs chives or marjoram as a garnish. Serve with crisp bread, potato chips or as is. The variations on this recipe are nearly endless. Add a little crushed garlic, chopped chillies, chervil, cilantro, tarragon or flat-leaf parsley in whatever ratios you feel like. But be careful, too much garlic and tarragon can easily overpower the avocado.